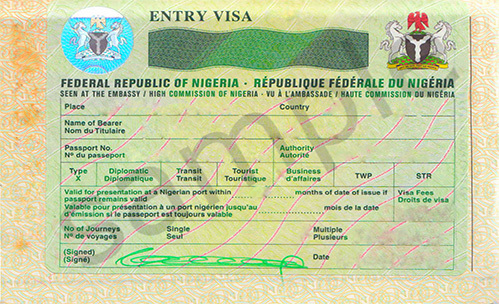 All Danish citizens must obtain a visa to Nigeria before entry to the country. Alt Rejser is ready to help you with that. Fully completed order form which you can find if you click here order form. Original passport with min. two blank/empty pages. The passport must be valid for a min. of 6 months besides the validity period of the visa. 2 pieces colored passport photo with white background. You can have your passport photo taken at Alt Rejser (150 kr). Confirmation of hotel reservation or an invitation letter from a private person. A copy of the inviting persons' passort must be attached to the invitation letter. Copy of flight ticket (two way flight ticket). Latest pay check or a copy of your employment contract. Send all the needed documents to Alt Rejser together with a følgebrev, or submit it personally in our office. Note: If your case is urgent, we recommend that you send the documents to us, as a “Quickbrev” or as a registered letter. In this case the post must be handed over to the post office and we must be able to receive it the following day. If you send it as a normal post, it will take up to 7 days (or more) before we will recieve the case. Invitation from a company in Nigeria. Guarantee letter from your Danish employer that explains the detailed purpose of your travel in Nigeria. Send all the needed documents to Alt Rejser together with a følgebrev, or you can submit it personally in our office at Vest Vesterbrogade 6 D in Copenhagen. Note: If your case is urgent, we recommend that you send the documents to us, as a “Quickbrev” or as a registered letter. In this case the post must be handed over to the post office and we must be able to receive it the following day. If you send it as a normal post, it will take up to 7 days (or more) before we can recieve your case. You will be informed of the length of the processing period when Alt Rejser has recieve all your documents (it is however min. 8 working days).